Location: Linac, in the Meurthe-et-Moselle departement of France (Lorraine Region). Notes: The castle of Puy-Launay is a castle located in Linac, France.The castle of Puy-Launay is located away from the village of Linac, on a hill overlooking the valleys of Bervezou and Burlande, in a green landscape on the Cantal. The castle mentioned in the thirteenth century was situated on the lands belonging to the abbey of Aurillac. The site is called "Puech Léonès" in a reconnaissance in 1279, then "Puech Launès" in 1504, before the transformation of Puech in Puy and Launès in Launay in the twentieth century. In 1279, the fief belongs to Rigal Guignabert. In the following century, the fief belongs to the Rabassier family. Étienne Rabassier was mentioned in 1399. In 1438, Marie Rbassier brought the seigneury to Eustache de Narbonnès. In 1504, Eustache II, his son, born about 1440, counted for Puylaunes. In 1602, Jean de Narbonnès died without heir. The following year, his widow, Jeanne de Luzech, remarried with Louis Ferdinand de Lostranges. It will result in a lawsuit with the sisters of her first husband who claim the seigniory. An agreement comes in 1607. The castle returns to Balthasard de Cadrieu, son of a sister of Jean de Narbonnès. The grandson sold the castle in 1658 to Guillaume de Dumas, a president of the Figeac Election. His daughter, married to the Marquis de Bournazel, inherited it. Then the castle passes to the Buisson, then to the Durfort-Boissières. Alphonse-Armand de Durfort-Boissières sold the castle in 1786 to Étienne de Palhasse de Salgues who lived in the castle until 1803. His children refused the succession and the castle was sold by legal sale in 1812. 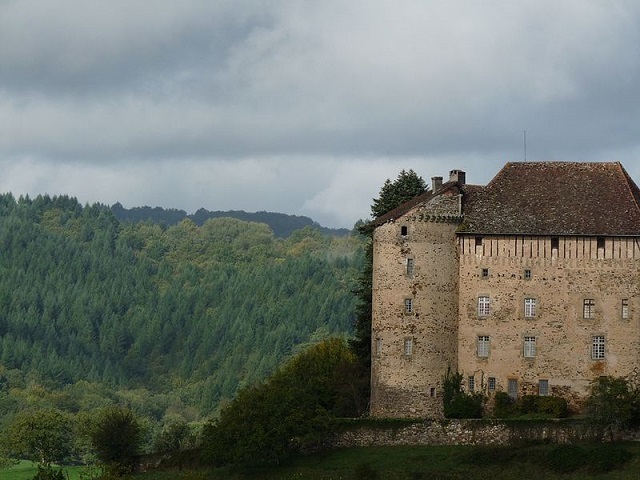 The castle and the ensemble Of the properties associated with it constituting an estate of 110 hectares are bought by Antoine Chassari, confessed to Millau. This one sold by lot this domain. The castle sold in 1834 to Pierre Bel with a park reduced to 2 hectares. The castle remained in its descendants.